The third edition of the civil society report Spotlight on Sustainable Development states that unpaid care work represents the largest subsidy to the global economy and the main obstacle for women´s economic participation. Care public policies are needed to transform the social organization of care and narrow gender gaps. 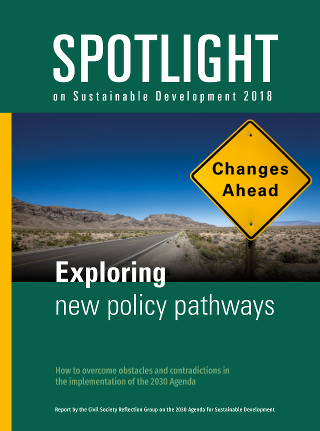 New York, 19 July 2017: Despite soaring rhetoric, glossy reports and slick presentations, the fact remains that implementation on the ground is “stalled”, as highlighted in a series of civil society national reports as part of the global Spotlight Report initiative. New York, 18 July 2017: During the Voluntary National Reviews (VNR) of 44 countries at the 2017 High-level Political Forum on Sustainable Development, many civil society activists raised questions, criticizing government (in-)action as well as crippling framework conditions that slow down implementation of the 2030 Agenda at the national level. New York, 12 July 2017: SDG2 ‘end hunger, achieve food security and improved nutrition and promote sustainable agriculture, articulates one of the highest aspirations of the 2030 Agenda. Failure to advance it will significantly affect the entire agenda, claims the Spotlight report, a comprehensive independent assessment released in New York on the opening day of the High Level Political Forum 2017.